Synopsis: Estranged from his wife and daughter, former undercover cop Mark Mallen has spent the last four years in a haze of heroin. When his best friend from the academy, Eric Russ, is murdered, all the evidence points to Mallen as the primer suspect. Now Mallen's former colleagues on the force are turning up the heat and Russ's survivors are asking him to come up with some answers. But if he wants to serve justice to the real killer, Mallen knows he'll have to get clean. Turning a life around is hard work for a junkie, especially when a gang of low-life thugs wants him dead. Bruised, battered, and written off by nearly everyone, can Mallen keep clean and catch a killer? Untold Damage is a dark and gritty murder mystery and once I started reading it, didn't want to stop, even though it had me cringing at times with the graphic descriptions of heroin use. The main character, Mark Mallen was an undercover cop, and after getting addicted to heroin, is released from the force. He has hit rock bottom and his only thought is his next hit. Reality comes crashing down on him when Eric is killed and he is framed for the murder. Plus two enforcers from the drug gang he's infiltrated have discovered his identity and they are out to get him. The story is fast paced, action packed and will leave you reeling as you root for Mark to redeem himself. Thank you to TLC book tours for asking me to be part of the tour and Robert K. Lewis for creating the story of Mark Mallen. Find out more about Robert by visiting his website or follow him on his blog, Twitter, and Facebook. Be sure to check out the previous stops on the tour. Thank you so much for you considerate and positive review! I really appreciate it. 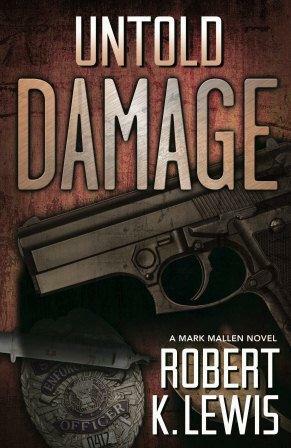 The next book in the series, CRITICAL DAMAGE, will be out April 2014. Thanks for being on the tour Robin! Glad you enjoyed this one.